This book is the first comprehensive and authoritative analysis of the New Deal and examines how far the programme has succeeded in responding to the diversity of conditions in local labour markets across the UK. Illustrated by a large series of original maps and figures. Based on numerous interviews with local and regional policy actors. Peter Sunley is Professor of Human Geography at the University of Southampton. He has authored around 50 articles on economic and labour geography and on local and regional economic development. Ron Martin is Professor of Economic Geography at the University of Cambridge, Professorial Fellow of St Catharine's College, Cambridge, and Fellow of the Cambridge-MIT Institute. He has published more than 20 books including Geographies of Labour Market Inequality (2003)and more than 150 articles on regional economic growth, the geography of finance, labour geography, and the geographies of state policy. Corinne Nativel is Research Fellow in the Department of Geography and Geomatics at the University of Glasgow. Her work centres on welfare restructuring, labour market and social policy with a special focus on youth and gender. She has published several books and articles including Economic Transition, Unemployment and Active Labour Market Policy (2004). "Not only examines how workfare has been put into place in the United Kingdom, but also puts the place into workfare." "Putting Workfare in Place is a diligently researched and empirically rich account of the significant changes to Britain’s work-welfare regime. Policymakers need to be aware of how institutional spaces and labour market conditions interact to produce local knowledges and Sunley, Martin and Nativel provide us with compelling evidence to question national assumptions of socio-economic development." "This book lays out a thoughtful assessment of the UK's New Deal program and the extent to which its underlying theory and ideology adequately reflect the geographies of unemployment. The authors do a masterful job, and policymakers, academics, policy advisers, and politicians will find this book both compelling and considered." 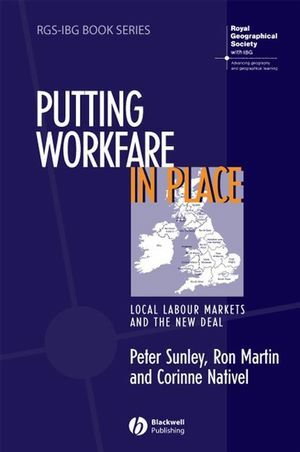 "A thought-provoking book, raising important questions about the impact of geography not only in shaping labour markets but also in conditioning the success of workfare policies … An inspiration for further research into the local dimensions of worklessness." The first comprehensive and authoritative analysis of the New Deal for Young People, introduced by the Labour Government in the UK in 1998. Considers how the New Deal has responded to diverse conditions in local labour markets across the UK.